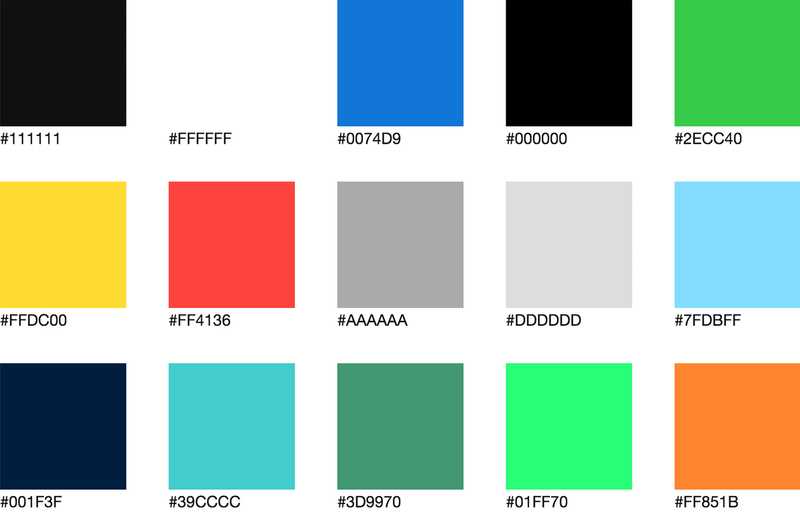 Virtually every style guide has a color palette section in its documentation. Many times I’ve seen this documentation created manually, where every change to a color requires updating the values in two places – the stylesheet and the style guide. This often leads to one falling out of sync with the other, and makes maintaining a living style guide more difficult. The problem with this approach is that the values are being defined in two different places. For a true living style guide, the code should serve as the single source of truth. Extracting color values from CSS can help keep documentation in sync, expose outdated colors, and point out opportunities for normalizing designs. The following will show how to use Node.js to build source-code-derived documentation for color palettes and present color contrast values for each possible pairing as a guide for usage. If you’re already using Node.js in your build system, you can integrate this directly into your project. For the purposes of this tutorial, create a new sandboxed project to experiment with. Copy a CSS file into the project to use as a source for the color values. This tutorial will use Basscss as an example. Create a new build.js file that will be used to read the CSS file and eventually to generate an HTML page. For now, this script just logs the stylesheet. Add a script to package.json for the build script. Run the script to make sure everything is working. Create a new lib/parse-colors.js file for parsing the CSS. Use this module in build.js. The parse-colors module takes raw CSS and transforms it into an AST that can be iterated over. For now, this just logs all the properties found in the stylesheet. Next update the parse module to filter out everything but color and background-color properties, convert the values to hex, and remove duplicates. While color values can be used in other properties including the background shorthand, handling that would add complexity and will be omitted from this tutorial. The first argument in root.eachDecl is a regular expression to filter declarations for either color or background-color. See the PostCSS documentation for more details. The Color().hexString() method converts any valid color value to hex format. The lodash _.uniq method removes duplicate values from an array. Inside the <ul> the .map() method is used to iterate over the colors array and passes the renderColor function as a callback. The renderColor function then renders an <li> for each color with a div that has its background color set to that value. Edit build.js to read the template and generate an HTML file. Now run npm start which should generate an HTML file with the colors parsed from the stylesheet. 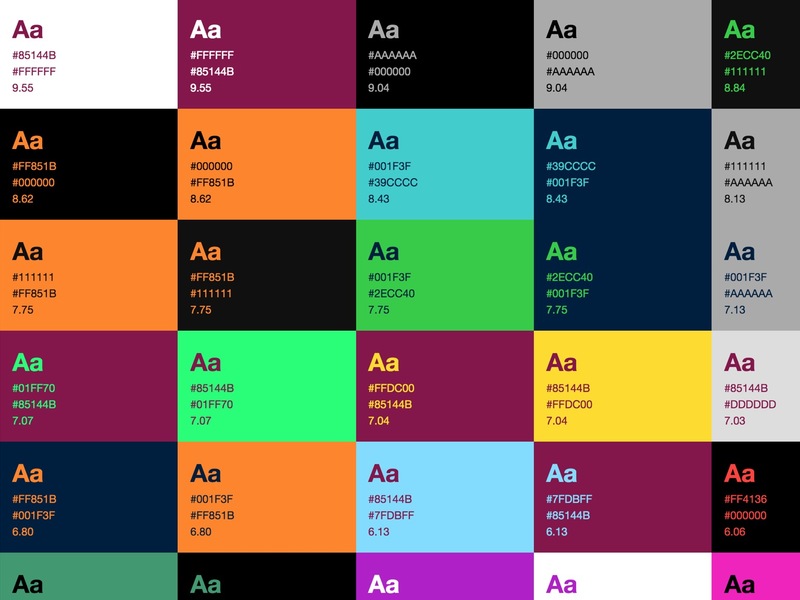 The Colorable module takes an array of colors and returns a nested array of color combinations, along with their contrast values to test for readability. This can be useful for seeing what foreground-background pairs can and can’t be used for text. Create a new lib/parse-combos.js file. Add the parse-combos module to build.js and pass the combos array into the template function. Add a section to template.html to display the color combinations. <li class="py2 col-6 sm-col-4 md-col-3 lg-col-2"
Run the build script. You should now have a list of color combinations along with the contrast value for each pair. While seeing combinations that don’t have high enough contrast might be useful, for this tutorial set Colorable’s threshold option to 3 to only show combinations that pass the WCAG minimum for large text. Run the build script again. Now you should only see color combinations with a contrast value of 3 or above. At this point, feel free to edit the styles of the rendered template and explore different ways of showing this information. You can also swap basscss.css out for another framework or stylesheet to test things out. In addition to displaying raw color values and contrast ratios, other aspects of color can be extracted from a stylesheet, such as the selectors used for each color or the number of times each color is used in a stylesheet. You could also show colors sorted by similarity to help expose inconsistencies and opportunities to normalize the design. While this is not a complete replacement for human written documentation, and creating guidelines around color usage requires carefully considered writing, using automated tooling to generate source-code-derived documentation for things like color values can help create better living style guides.